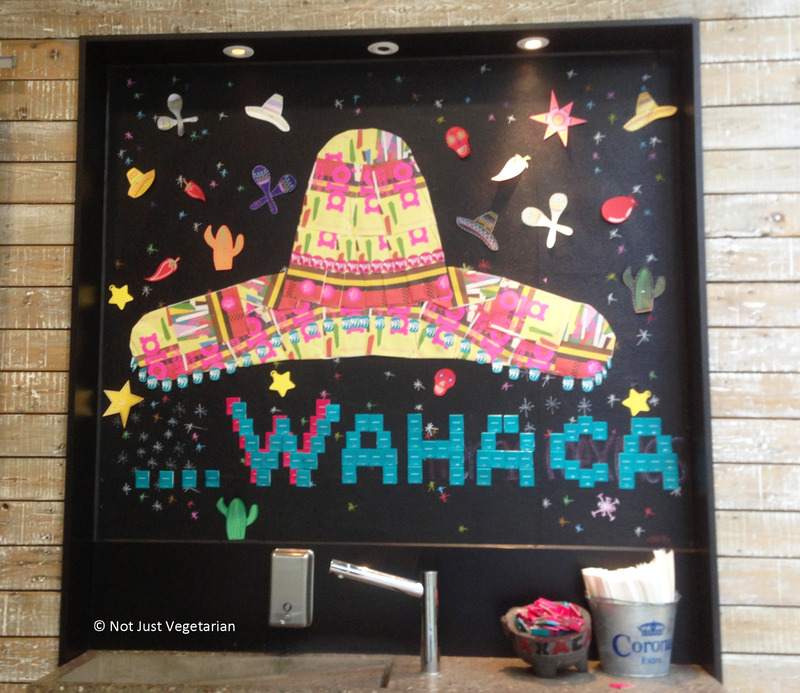 Wahaca, a restaurant (now a chain) serving Mexican Market Food, was founded by MasterChef (2005) winner Thomasina Miers. 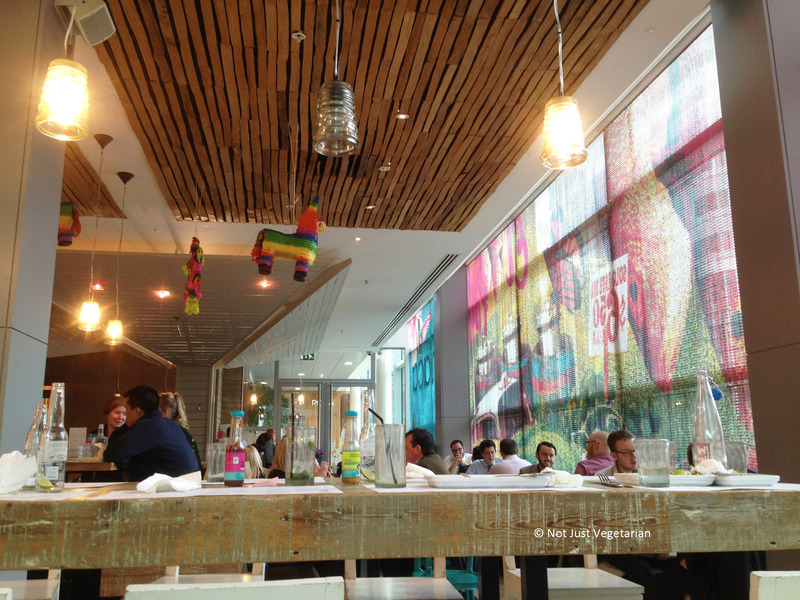 Wahaca has recently (in 2012 and 2013) won the Sustainable Restaurant Group of the Year award. 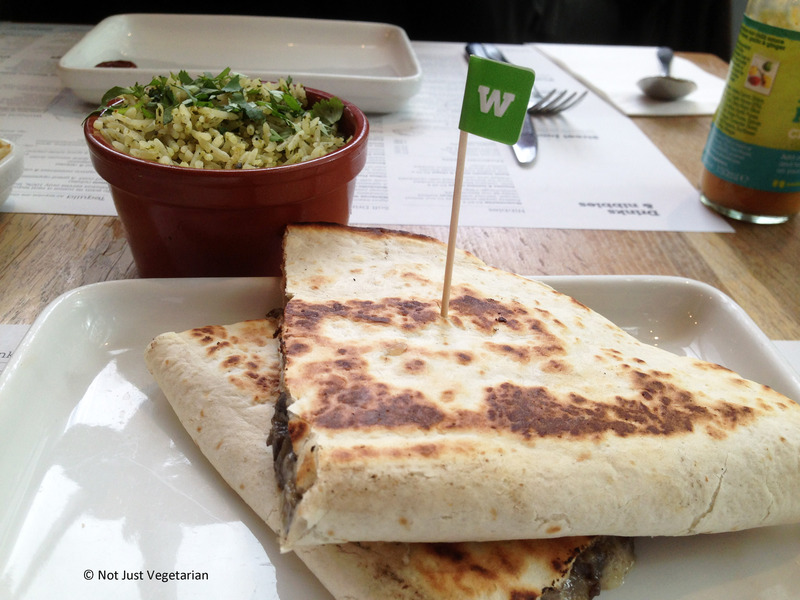 Wahaca offer lots of options for vegetarians and for those looking for (naturally) gluten-free dishes (there is a gluten-free menu as well). 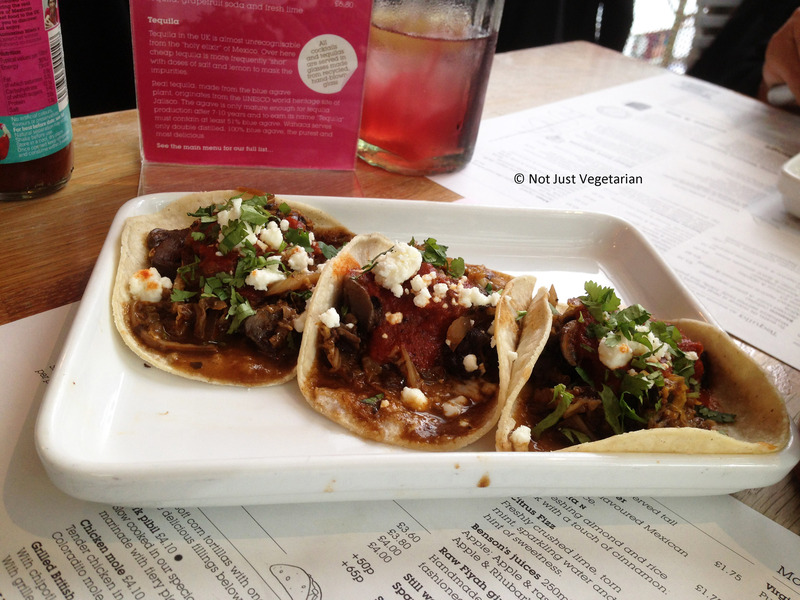 I loved everything we ate at Wahaca and am thrilled to have discovered it. 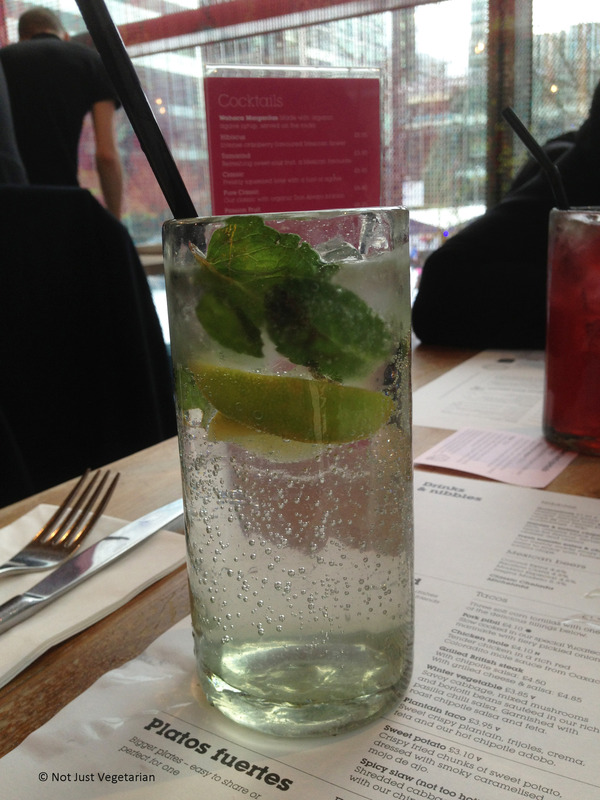 The Canary Wharf location of Wahaca that I visited is huge and yet very busy. We were lucky to have been seated without much of a wait (we went around noon). Service was friendly, courteous and mostly attentive (when we asked for our bill, they were busy with wrapping another table with many guests). The dishes at Wahaca are split into Nibbles, Street Food (mostly tacos), and Big Plates, Sides and Desserts. We got a few dishes from the Street Food section, a couple of sides and a soup . It was a light meal despite the cheese in almost every dish and yet the meal was very satisfying. Turned out that most of the dishes we ordered were vegetarian and naturally gluten-free (exception was the quesadilla that is not listed on the gluten-free menu). Citrus fizz was tangy with the lime and not too sweet. Loved it! Winter vegetable tacos were very light and not too spicy. The smokey chipotle salsa was the highlight of these tacos. The tacos were quite small though and were gone before we could blink. 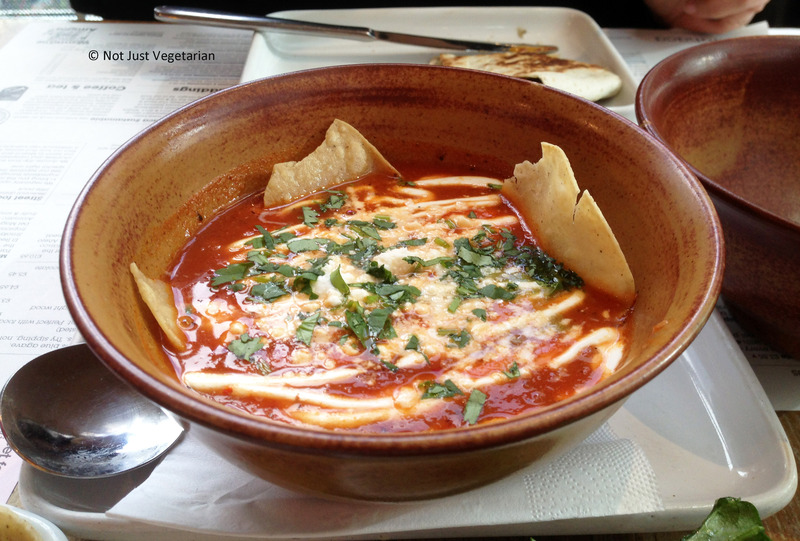 Tortilla Soup is good for one person, if you share (as we did), you will want more. The soup was not too spicy. 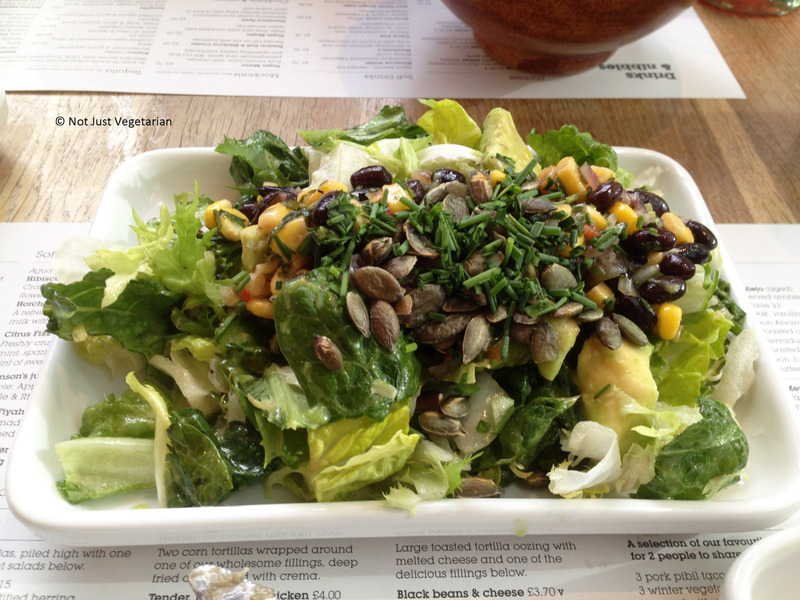 Corn and Bean salad was so light and delicious. Loved the toasted pumpkin seeds in the salad. Huitlacoche quesadilla was excellent with the earthy flavour of the mushrooms and the gooey melted cheese. Green rice (rice with coriander, onions and garlic) was a delicious side. I’d love to go back to Wahaca to discover other dishes on the menu and the desserts (Mexican chocolate tart, Salted caramel ice cream and more).